News of a terror attack in the heart of Tel Aviv was welcomed with joy by Hamas. Though Hamas did not claim responsibility for the attack, Hamas spokesman Sami Abu Zuhri commended the attack. "Hamas blesses the attack in Tel Aviv and sees it as a natural response to the Israeli massacres... in Gaza," Abu Zuhri told Reuters. Abu Zuhri added that "Palestinian factions will employ all means to protect the Palestinian people in the absence of global efforts to halt Israeli aggression." No group has officially claimed responsibility for the attack, but it was reported that the al-Aqsa Martyrs' Brigades, a terror organization affiliated with Fatah, may have been behind the bombing. Islamic Jihad also delivered praise of the attack: "This is a victory for the blood of shahids." Top Islamic Jihad operative responded to the attack in a television interview with Arab networks, saying: "All means are valid; including a suicide bombing." The Popular Resistance Committees lauded the Tel Aviv terror attack as well. 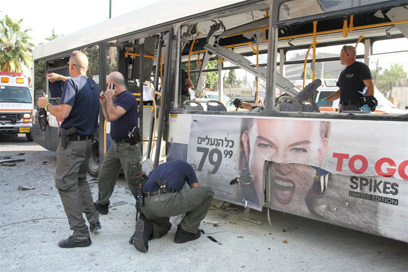 Earlier, the al-Mayadeen network in Gaza reported of celebratory gunfire in response to the explosion on the Tel Aviv bus. The network also reported that Hamas welcomed the bombing, describing it as a natural response to the "massacre of civilians" during Operation Pillar of Defense. The Tel Aviv bombing was also praised from Gaza mosque's loudspeakers, while Hamas' television interviewed people praising the attack as a return of the terrorists' trademark tactics. A few days after Operation Pillar of Defense was launched, Hamas issued a warning by which it vowed to bring back suicide bombings to the streets of Israeli towns in revenge for the killing of 11 members of the Daloo family in the Gaza Strip. See all talkbacks "Gaza: Celebrations over TA bombing"